Nehmen Sie einen Katamaran auf den Atlantik, um den Sonnenuntergang auf dieser 3,5-stündigen Segeltour von Ponta Delgada aus zu genießen. Bewundern Sie die wunderschöne Küstenlandschaft, während das Boot die Küste umarmt und nach dem perfekten Ort sucht, um die untergehende Sonne zu beobachten. Genießen Sie die lokalen Snacks und Getränke während der Tour und nehmen Sie sogar ein Bad im Wasser, wenn Sie möchten. I highly recommend for a quiet and relaxing evening on the water. The swim was refreshing, followed by a hot shower on board and then olives, bread, cheese and wine. We didn't get a sunset, but we loved the time on the water and our captain and host. Very accommodating crew who emphasized safety and attended to our needs. No whales seen, but beautiful rainbow and sunset. This was an amazing sunset catamaran cruise. The captain and staff on board were hospitable and they were over the top for safety. We looked for dolphins and had a chance to swim with a lifeguard who came in the water with us. Breathtaking views of the island and return to port into the sunset. Highly recommended by our entire group. We had snacks and Portuguese wine after swimming. The crew were top notch. Knowledgeable, interesting and truly amazing people. Best time ever, don't miss this! Ponta Delgada is an amazing place. How beautiful it was to see it from the sea. The sunset view from the ocean was gorgeous. The crew on the catamaran were very friendly and accommodating. Serving us tasty wine, along with olives and cheese from the island of St. Jorge. The sweet bread was delicious. This was awesome! The captain, Luis, was wonderful. We had a great and relaxing time and got to see an amazing sunset. We took our own pictures, but they also took pictures and sent them to us via email. I highly recommend! and to relax with good company having drink of wine local cheeses and Azores olives where good. 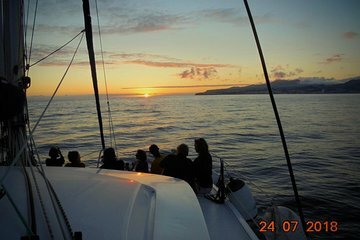 And picture where taken of the trip and email, Thank you Luis Captain and crew for a wonderful Sunset Sailing Tour.